Manchester United fought back twice to draw 2-2 at home to in-form Arsenal at Old Trafford this evening. This was our third successive Premier League draw which sees us drop 10 points behind the top four following Tottenham Hotspur’s 3-1 thrashing of Southampton this evening. David de Gea failed to keep out Shkodran Mustafi’s header before Anthony Martial quickly equalised in the first half. We fell behind midway through the second half through substitute Alexandre Lacazette before a defensive error from the visitors led to Jesse Lingard making it 2-2. David de Gea 4 – Will be disappointed with the opening goal as Shkodran Mustafi’s header bounced on the six-yard line and David de Gea allowed it to cross the line, albeit narrowly. Made a couple of good saves. Diogo Dalot 7 – Solid performance at right-back the 19-year-old’s first Premier League start. Diogo Dalot didn’t let the Arsenal attack get in behind him. Eric Bailly 7 – Impressive return in his first appearances in 10 games; Eric Bailly did tire towards the end of the game but that was understandable. He missed the weekend’s game due to injury so we don’t know how close to full fitness the centre-back actually was. Chris Smalling 6 – Arsenal had a lot of the play in our half but they didn’t create too many clear-cut chances. Both goals can be credited to mistakes on our behalf. Marcos Rojo 5 – Deserved yellow card for a late challenge on Matteo Guendouzi late in the first half moments after having his effort from 18 yards blocked. Was having a good game before being caught in possession that led to Arsenal’s second goal. Replaced shortly after. Matteo Darmian 6 – Looked good in possession trying to start attacks from down the left in the first half but quiet after the break as Arsenal took the game to us. Hector Bellerin and Alexandre Lacazette created little down our left. Ander Herrera 8 – Worked hard in winning the ball back for us time and time again and looked after the ball when he was in possession. Wasn’t too much creativity in the middle as we relied on the assistant referee keeping his flag down for our opening goal and a defensive mistake for the second. Nemanja Matic 5 – Picked up a yellow card by taking one for the team by pulling back Pierre-Emerick Aubameyang moments after Ander Herrera passed the ball to the Arsenal striker on the halfway line towards the end of the first half. 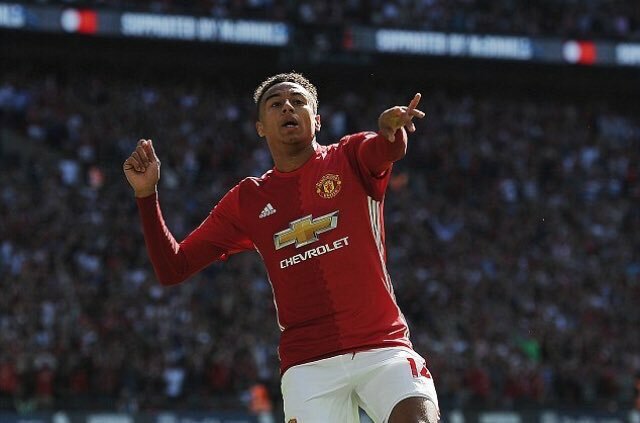 Jesse Lingard 7 – Cool finish after being played in by Sead Kolasinac for his first goal of the season 74 seconds after we went behind for the second time. Worked hard off the ball and won back possession for us a number of times. Marcus Rashford 5 – Often isolated up front and only fired in two efforts on Bernd Leno’s goal. The German goalkeeper made a meal of one in the final couple of minutes from a swerving effort from Marcus Rashford. Credit to the striker to making some good runs off the ball but we lacked any creativity up front. Anthony Martial 6 – Good awareness to rebound home our equaliser in the first half. Anthony Martial has now scored seven goals in his last eight Premier League appearances. Didn’t see a lot of possession nor many sights on goal and was replaced just after the hour. Romelu Lukaku (29 mins) – Came on for the final half hour and had barely touched the ball. Marouane Fellaini (20 mins) – Replaced the injured Marcos Rojo in what was a more attacking change but Arsenal finished the game the stronger. Paul Pogba (17 mins) – Wasn’t given much of an opportunity to make an impact as Paul Pogba didn’t create anything nor test Bernd Leno himself.